We continue work on the effects of changing climate on hydrology and biogeochemistry of forest watersheds. There are two components to this work. First we continue long-term measurements and experiments on climate change at Hubbard Brook. A focus of this research is on winter climate change, including effects on snowpack accumulation and below ground winter processes. We hypothesize that climate change is driving the northern forest toward a condition of oligiotrophication (decreasing nutrient status; Groffman et al. 2018). We submitted a proposal to NSF to test this hypothesis which was not successful and are working on a revised proposal to submit later this year. 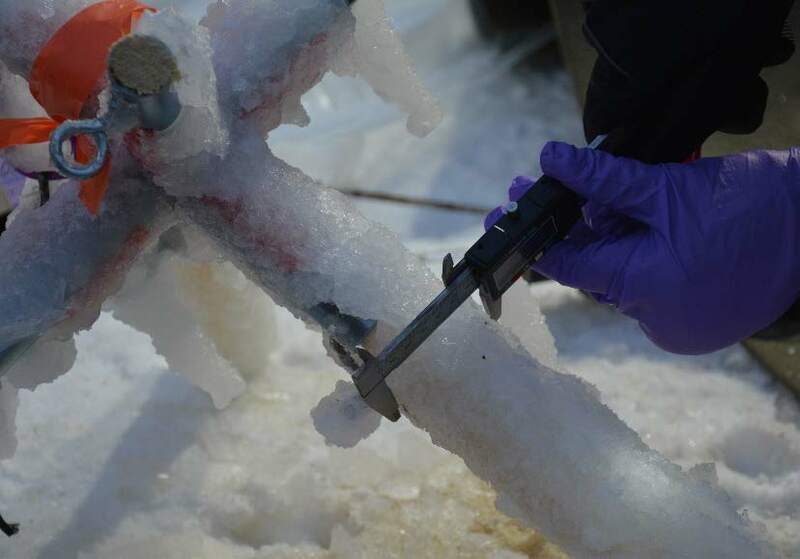 Climate change research at Hubbard Brook has expanded with an NSF-funded project examining the effects of ice storms on the structure and function of the northern forest. Plots were established and experimental icing treatments ice storm conducted during winters 2016 and 2017 (see photos below). The National Science Foundation developed a video on this research project (https://www.youtube.com/watch?v=UKlPbyhSK80). 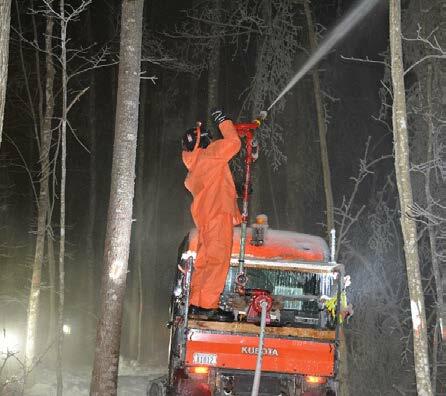 Photos of experimental water application to the forest canopy to simulate icing conditions and measurements of ice storm effects at Hubbard Brook. The second component of this research program on climate change effects is the application of statistically-downscaled climate projections from global general circulation models (GCMs) as inputs to PnET-BGC to simulate the long-term hydrology and hydrochemical response to forest watersheds to future climate change. Simulations have been conducted at long-term watershed sites across the US (e.g., Hubbard Brook, NH; Huntington Forest, NY; Sleepers River, VT; Fernow Experimental Forest, WV, Niwot Ridge CO, Loch Vale, CO, H.J. Andrews, OR) (Zheng Dong PhD student; Dong et al. 2018). Dong, Z., C. T. Driscoll, S. Johnson, J. Campbell, A. Pourmokhtarian, A. Stoner and K. Hayhoe. 2018. Projections of water, carbon, and nitrogen under future climate change in an alpine tundra ecosystem in the southern Rocky Mountains. Science of the Total Environment. 650(1):1451-1464. doi: 10.1016/j.scitotenv.2018.09.151. Groffman, P. M., C. T. Driscoll, J. Durán, J. Campbell, L. Christenson, T. Fahey, M. Fisk, C. Fuss, G. Likens, G. Lovett, L. Rustad and P. Templer. 2018. Nitrogen oligotrophication in northern hardwood forests. Biogeochemistry. doi:10.1007/s10533-018-0445-y.